Have you ever noticed an inverse relationship between the behavior of parents and their children in the early hours of school mornings? As parents become increasingly frazzled and hectic, active children tend to downshift and reduce speed. Be proud and take a bow if you’re not familiar with this phenomenon! Yet for the vast majority of parents, this scene will ring true. 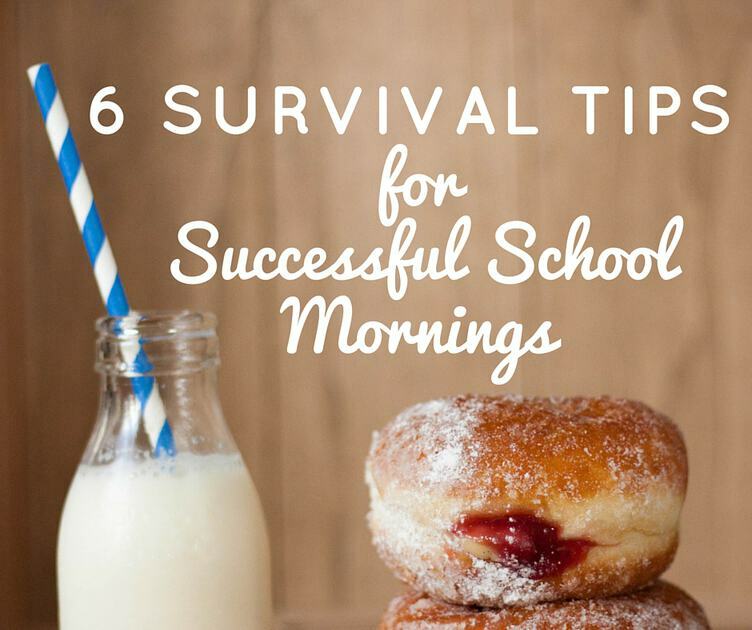 The following tips can help you to break this unproductive routine, and to develop a new strategy to triumph over the trials of school mornings. If you’re seeking to start the day off on the right foot, don’t wait until the wee hours of dawn to take your first step. The night before is the most appropriate, efficient time to launch a new day. Make lunch ahead of time. To avoid soggy sandwiches, you can prepare the fillings and toppings in advance and then assemble it all in the morning. Fruit slices and veggie sticks can be packed in airtight containers beforehand. School bags should be fully packed before going to bed, including all homework and signed permission slips. Arrange and match all clothing, including socks or hairbands, the night before. This habit prevents last-minute panic attacks upon discovering an empty drawer. If your gas tank is getting low, don’t wait until you drive carpool to fill up. There’s never time to spare on the way to school. Do your shoes seem to go for a stroll in the middle of the night? The case of the disappearing shoe is common. Always set shoes in a prominent and natural place, such as next to the front door or on the floor of your closet. Go to bed on time. In order to have energy and patience for the upcoming day, both children and adults require enough hours of shut-eye. No matter how reliable you feel your internal clock is, alarm clocks are still essential. Purchase a personal alarm clock for all family members and set it for the same minute. Whether it’s a digital display with purple glitter or a vintage stainless steel bell, allowing children to select their preference can encourage them to react positively when the alarm sounds. Let your family democratically debate and decide the ideal wake-up time. This magic hour must be written in stone and not snoozable! Remember to allocate more time than you may expect, for there are always unpredictable delays. Everyone, especially children, thrives on the comforts of a regular routine. In general, self-esteem and confidence are bolstered when expectations are clear and goals can be achieved. Once your children’s feet hit the floor, they should be able to slide smoothly into their next move. Outline the morning schedule during a family meeting. A plan generated through teamwork is more motivating than a mandate, as no one feels that they were coerced into following someone else’s ideas. List, laminate and hang up the morning itinerary, leaving nothing out. Even the most obvious jobs, such as “wake up and get dressed,” should be posted for all to see. This will save you from chasing your kids around and shouting out reminder commands. Kids love to play games. You can transform the entire morning into a race, with each family member competing for the best time or racing against the clock, setting time limits for finishing specific tasks. The winner should be rewarded with an attractive prize. Concentrate on your morning itinerary and avoid distractions. School mornings aren’t the time to finish the last chapter of that book or to add the final strokes to your landscape painting. In addition, don’t get bogged down in any complicated or heavy, emotional discussions. Push these off until evening. Breakfast should be as simple and effortless as possible, while still serving up nutrition that will jumpstart the day. Whole-grain cereals and milk, protein bars, or yogurt topped with fruit and granola are all tasty, satisfying options that are easy to put together. Foods that demand more attention or preparation should be made in advance. Mornings are a time to transition from sleep hours into an activity-filled day. Changing modes can be hard for anyone; even implementing the aforementioned tips can be challenging. Why not give these ideas a whirl in advance? Pretend it’s morning, and try out your routine when you’re not genuinely immersed in the frenzy of school mornings. Although practice may not make the mornings perfect, it’s sure to help your family get through the morning and out the door.